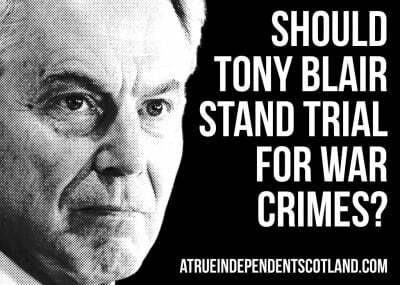 Should Tony Blair Stand Trial for War Crimes? Ex Labour and British Prime Minister Tony Blair stands accused of War Crimes pertaining to Britain’s role in the Iraq war were it is estimated by some observers, that more than 1,000,000 people died and a further 4.000,000 were displaced or injured and their homes destroyed, the majority of them being civilians. Tony Blair sickeningly calls the atrocities committed in the Iraq war against mostly women and children “collateral damage”, a popular term now used by his replacement, Tory PM David Cameron, to describe his own war crimes in Libya. The Chilcot inquiry’s publication is continually kicked into the long grass in the hopes that the public s wrath will dissipate over time and the crimes forgotten about. In November 2011 the Kuala Lumpur War Crimes Tribunal purportedly exercised universal jurisdiction to try in absentia former US President George W. Bush and former British Prime Minister Tony Blair, convicting both for crimes against peace because of what the tribunal concluded was the unlawful invasion of Iraq. So what do you think, should Tony Blair face trial in the Hague for war crimes?